Convert a string item into the requested character set. tocs Character set to to convert the string to. lossless Whether data loss is acceptable. A new item representing the converted string. Return TRUE if character-set-introducer was explicitly specified in the original query for this item (text literal). 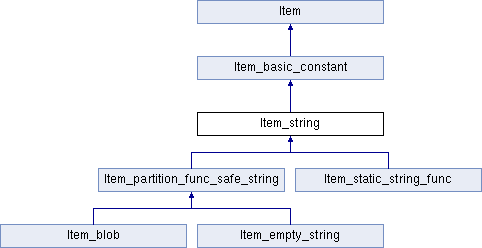 This operation is to be called from Item_string::print(). The idea is that when a query is generated (re-constructed) from the Item-tree, character-set-introducers should appear only for those literals, where they were explicitly specified by the user. Otherwise, that may lead to loss collation information (character set introducers implies default collation for the literal). Basically, that makes sense only for views and hopefully will be gone one day when we start using original query as a view definition. This operation returns the value of m_cs_specified attribute. TRUE if character set introducer was explicitly specified in the original query. Set the value of m_cs_specified attribute. m_cs_specified attribute shows whether character-set-introducer was explicitly specified in the original query for this text literal or not. The attribute makes sense (is used) only for views. This operation is to be called from the parser during parsing an input query.